A teacher once told me: “You become what you think”. She wasn’t talking about The Secret or New Age manifestation. She was talking about how the mind often (mis)intreprets our reality. Every moment. Because thinking is the often the primer which interprets everyday experience, we often find our reality through our mind. And, while this is not in and of itself a ‘bad’ thing, thought is not the only way to find understanding. Any practiced yogi will tell you, the mind is something to watch not live in! Simply, you are not your mind. The more we can learn to understand and tap into ourselves holistically, the more we can understand what we need and take care. One teaching tool from yoga philosophy that is particularly helpful for integrative understanding is discussion of the koshas. 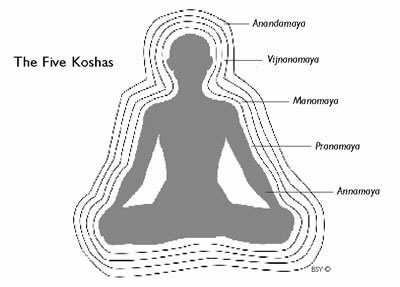 The koshas or “sheaths” describe a way to energetically investigate how different aspects of our physiological body interrelate. Since dis-ease usually manifests at the junction between body, thought, and emotion, using the kosha theory to help transcend the segmentation and compartmentalization is particularly effective. We are energetic beings. It time to feel it! One way to understand our energetic systems is to understand our koshas and how they interrelate. Thoughts have energy. Feelings have energy. Breath has energy. Each of these energies plays on each other and effects our experience of being embodied holistically. According the koshas, we have five layers of subtle energy that interconnect and ultimately manifest in physical body. "[!e! ]ach metaphorical "body" is contained within the next: annamaya kosha—the physical body; pranamaya kosha—the breath or life-force body; manomaya kosha—the mental body; vijanamaya kosha—the wisdom body; and anandamaya kosha—the bliss body. These energies nest into each other like Russian nesting dolls, but, unlike nesting dolls, shifts in each individual kosha can affect the energetic system holistically. Simply, negative thinking can show up in physical postures or ailments. Deep breathing can illicit peace, relaxing both the body and mind. Further, the koshas postulate that our feelings live on our ‘breath body’; if we change our breathing, we can often alter the energy of an emotion or vice versa. An important distinction that the koshas teach us is that our thinking mind is separate from our wisdom. This is a helpful framework when challenging cognitions and thought patterns that manifest negatively on the body. This is how yoga works! Rather than believing our worst narratives, we can use the body and the breath to challenge old beliefs and create a new reality. Often, we are too quick to take things at thought value. The koshas remind us there are many valid layers of experience to being embodied. We are more than a thought or feeling. We are alive, energetic systems.